Bujinkan UAE proudly held its fifth seminar with 15th Dan Dai Shihan Marcelo Ferraro who visited us on his way to Japan with a contingent of advanced students from Argentina, giving us the opportunity to train under the guidance of one of the most advanced ninjutsu masters from Latin America. This seminar was held from November 24th to 26th at the Shangri-La Hotel, Qaryat Al Beri, Abu Dhabi. 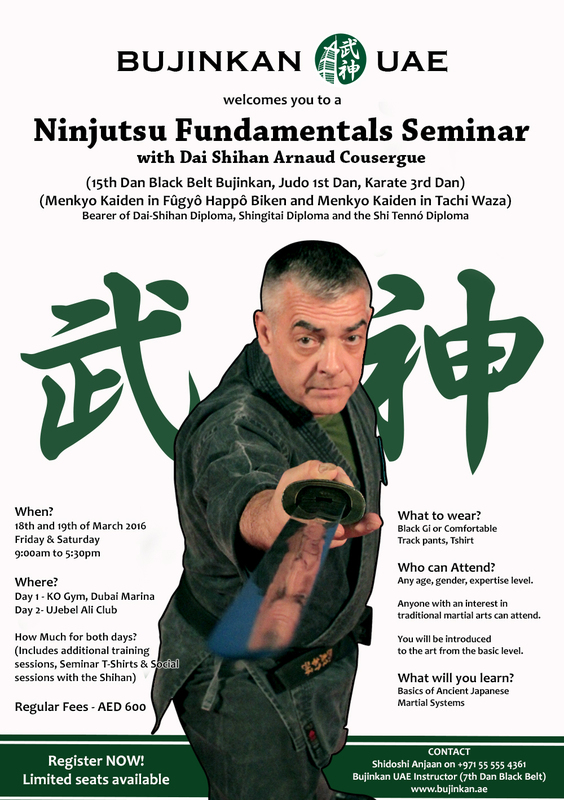 Bujinkan UAE proudly held its fourth seminar with 15th Dan Dai Shihan Arnaud Cousergue to dive deep into one of the nine schools of Bujinkan. This two days seminar was open to everyone, beginners or practitioners of any seniority, and we went through the first two levels of this Samurai school, learning conflict resolution, awareness development, balance, rolls and jumps, stances, punches, blocks, kicks, throws, locks, pins, evasions, grappling, reversals, weapons, groundwork, vocabulary, martial philosophy, and much, much more. 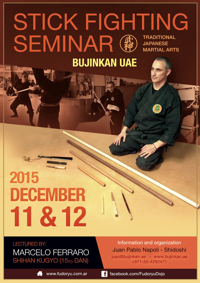 This seminar was also the occasion of the first Sakki test in the UAE. Bujinkan UAE proudly held its third seminar with 15th Dan Dai Shihan Arnaud Cousergue to get oriented in the ancient martial art of Ninjutsu. This 2 Day Ninjutsu Fundamentals Seminar was a fantastic opportunity to train with one of the most senior practitioner of our martial art, and one of the top students of Sōke Masaaki Hatsumi (Grandmaster and founder of Bujinkan). This two days seminar was open to everyone, beginners or practitioners of any seniority, and we learned conflict resolution, awareness development, balance, rolls and jumps, stances, punches, blocks, kicks, throws, locks, pins, evasions, grappling, reversals, weapons, groundwork, vocabulary, martial philosophy, and much, much more. 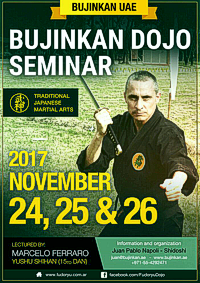 This seminar covered the essential techniques of Bō-Jutsu, Hanbō-Jutsu and Jō-Jutsu under supervision of one of the top ranked instructors in our martial arts, Argentinean Yūshū Shihan Marcelo Ferraro (15th Dan) from Fudō-Ryū Dōjō. 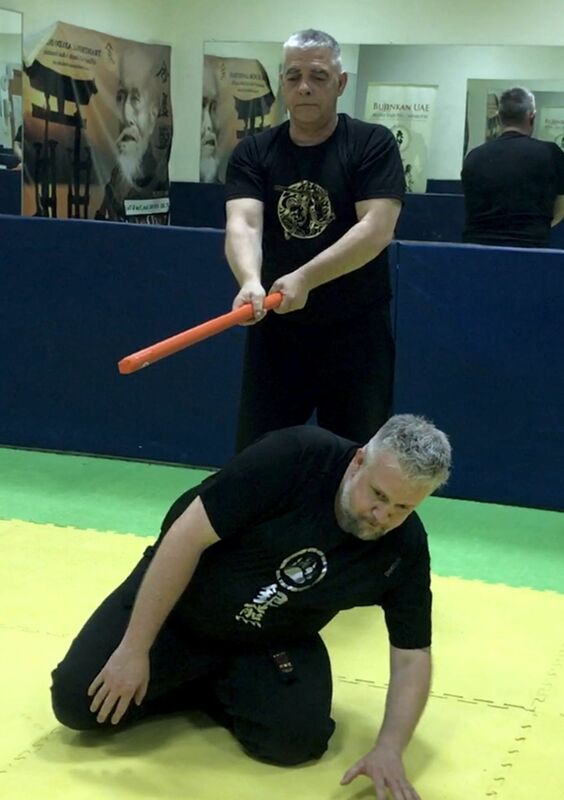 Arnaud Cousergue has been training for more than 45 years in martial arts, including 30 years in Bujinkan. He has given Seminars all over the world and conducted many Taikai (international training sessions). He travels 3 times to Japan every year to train under Sōke Masaaki Hatsumi. He holds a 15th Dan black belt in Bujinkan, a 3rd Dan black belt in Karate, and a 1st Dan Black Belt in Judo. Arnaud Cousergue has received a Menkyo Kaiden in Fugyō Happō Biken in 2002 and in Tachi Waza in 2004. Menkyos are the highest degrees of transmission in martial arts. He also has been awarded the highest level of diplomas in Bujinkan, including the Shingitai in 2011 and Shi Tennō in 2012. Being the technical mentor to many Dōjōs around the world, he is the leading light for many martial artists who follow him for his knowledge, skills and experience. He shares his martial thoughts on his blog. 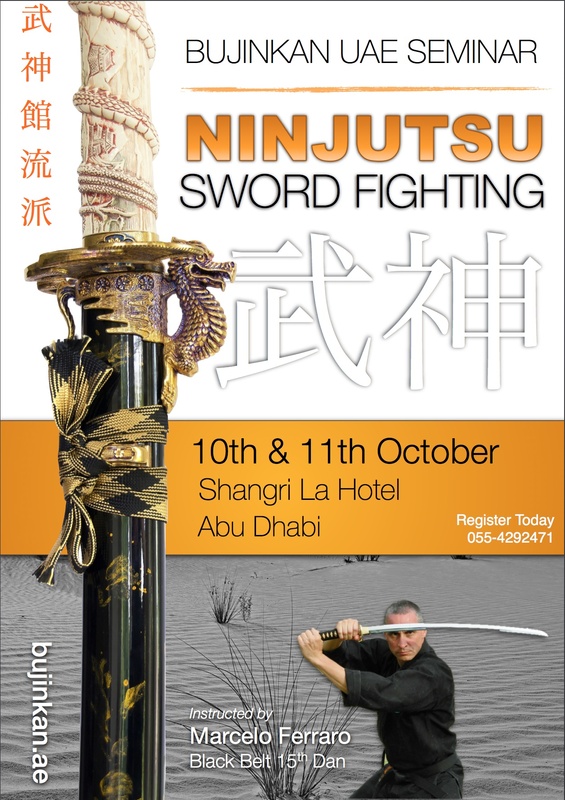 This Seminar was the first Sword Fighting seminar in the Gulf Region. Delivered by one of the top-rank instructors in Bujinkan, Argentinean Shihan Marcelo Ferraro (15th Dan), Fudō-Ryū Dōjō, together with Shihan Pablo Sturla (10th Dan) and Shihan Alejandro Cordara (10th Dan), all returning from their training with Sōke Masaaki Hatsumi in Japan. The seminar was held at Shangri La Qaryat Al Beri, on an all natural green private beach, with access to changing rooms and showers for ultimate confort and an outstanding sunset view of the Sheik Zayed Mosque. 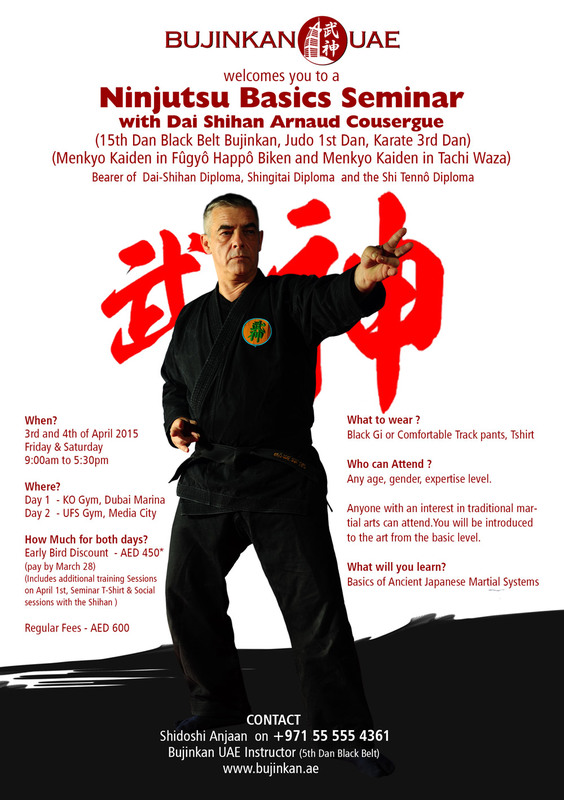 This seminar targeted an audience from 10 to 55 years old, with or without martial arts experience.